This healthy no-churn sorbet can be made in a few minutes and is exclusively fruit. It’s tangy, zesty, sweet and tastes just as good as shop bought sorbet only without added sugar and other junk. Two limes might seem like a lot in this sorbet but this is a lime sorbet so you do want that sharp tangy citrus lime flavor. Suitable for no added sugar, dairy-free, raw vegan and general healthy diets. Peel both limes and chop into chunks. 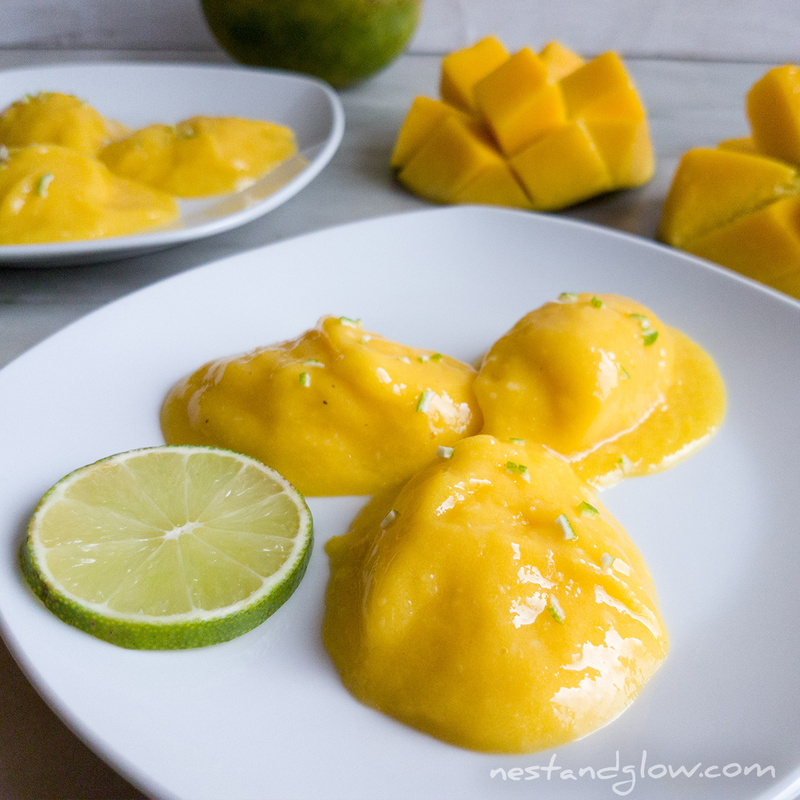 Add the lime and banana in a blender closest to the blade then add the mango. This is as the blender will easily whizz up the lime and banana then be able to blend the frozen mango. Serve with a few shreds of grated lime zest. I always peel my limes for this as it means you eat the pith. The pith contains many nutrients such as a huge amount of vitamin C and some vitamin A, B6, B5 and calcium. Once it’s blended you don’t really notice the pith and the slightly bitter taste elevates the depth of flavor. The pith is also full of fiber and this helps give great texture. Don’t worry if you don’t peel your limes perfectly as the odd bit of skin helps add to the flavor. The oil in the skin also contains many nutrients and balances the flavor with a bitter taste. 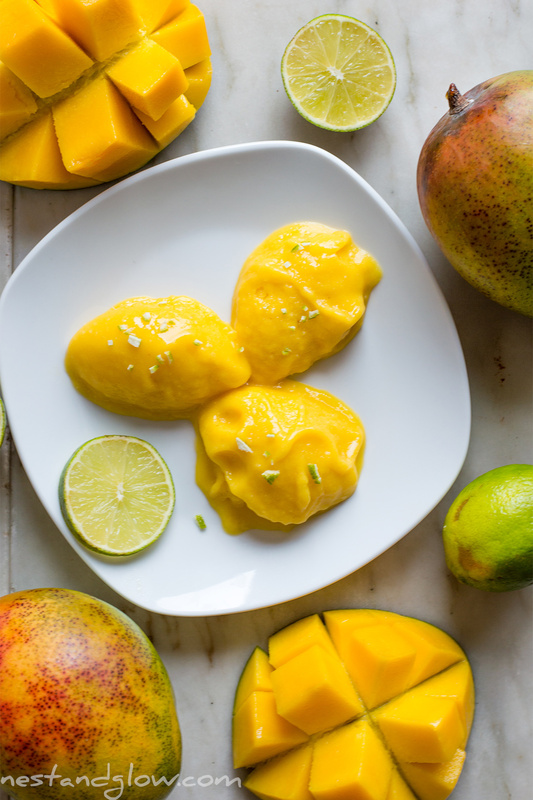 I use frozen shop bought mango with this as I don’t live in a tropical climate and I often find frozen mango is the best mango on sale. 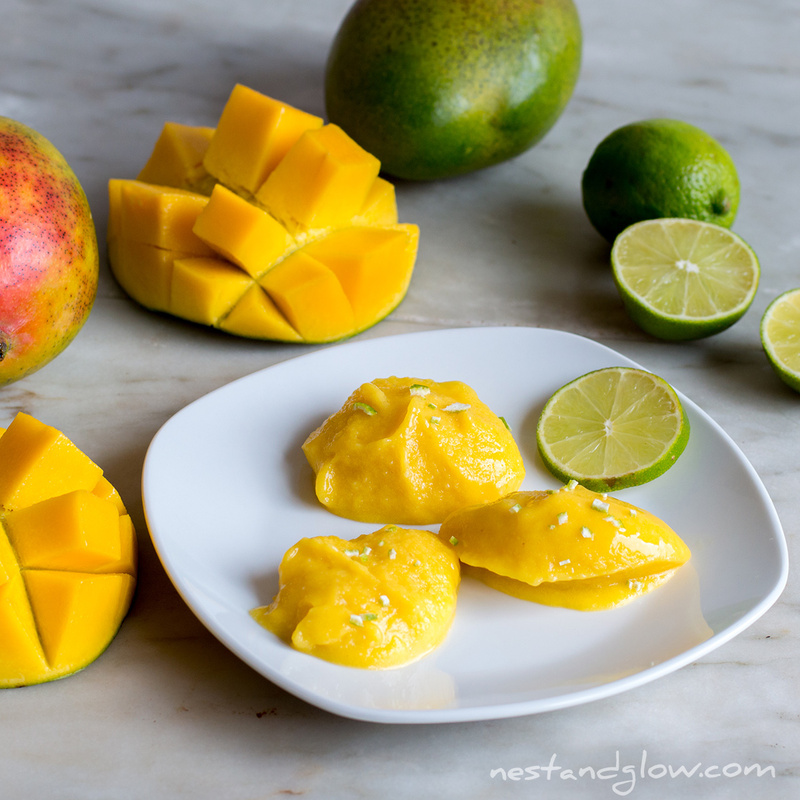 You can freeze your own mango if you have a good supply of fresh mango. 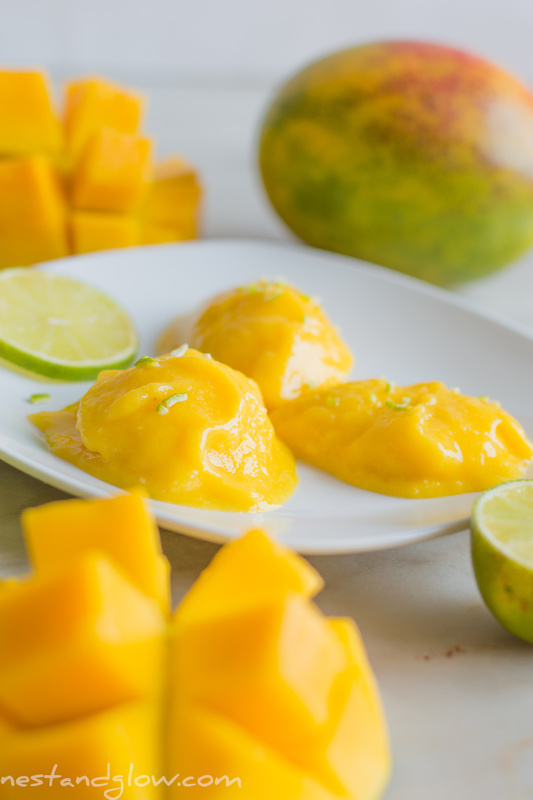 About two medium mangoes make enough mango chunks for this sorbet. This sorbet has the consistency similar to a soft serve ice cream. You can pour it into a small dish and freeze if you want to make in advance. Just take out half an hour before serving. The photos and videos make it looks like it melts quicker than it actually does. If you are not playing about with polishing plates, setting up chopped decorative fruit and setting up a frame then it won’t become as liquid as it looks here.